some trees I have made, tattoos and the like. 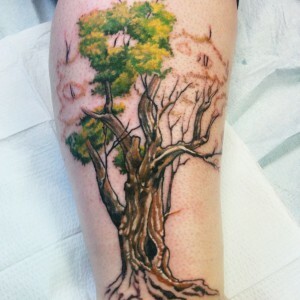 Most of the tattoo trees I do are drawn on the skin, in marker, right before being tattooed. 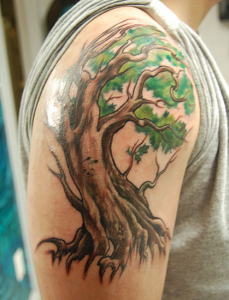 That way the person getting the tattoo can control the size and scale better, and I get a better feeling for the flow the tree needs to have to fit on three dimensions. I go outside and look at trees. That’s what I use for reference-I take a lot of photographs of trees as well. I love drawing them. I used to climb trees all the time. Actually I still do when I see a decent climbing tree. 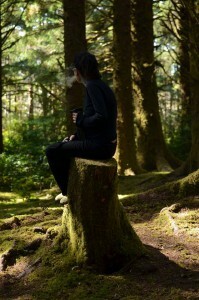 Climbing a tree was always a way for me to get some time alone in a house full of extroverts- a way to escape. I learned a lot about what each tree was like. They not only have a personality because of their species, but individually too. 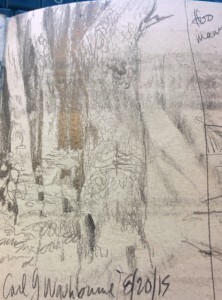 Willows are always friendly and mellow, but can be risky to climb- they like to slip their bark once you’re high enough to get hurt by falling. 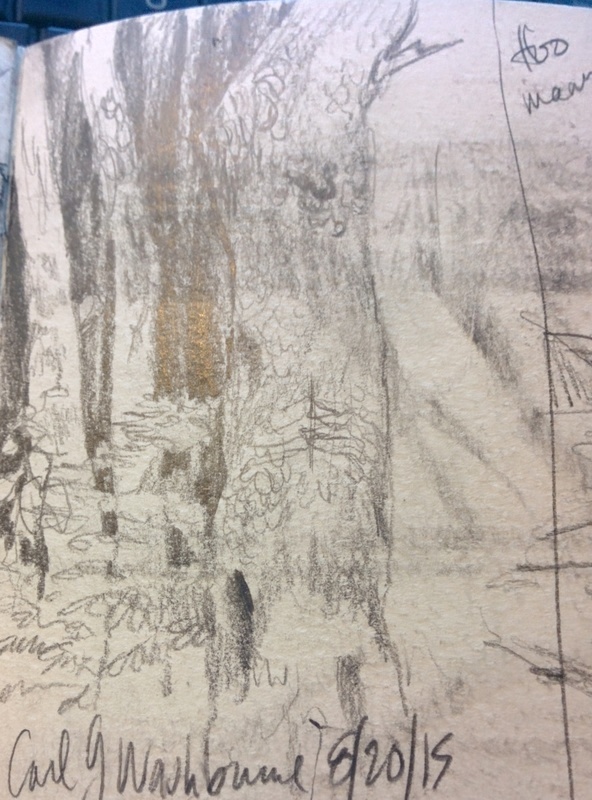 Oaks are big and old and kindly, but their twigs are crackled and dry. Birches are my favorite trees- spry, springy, and easy to take a nap in. 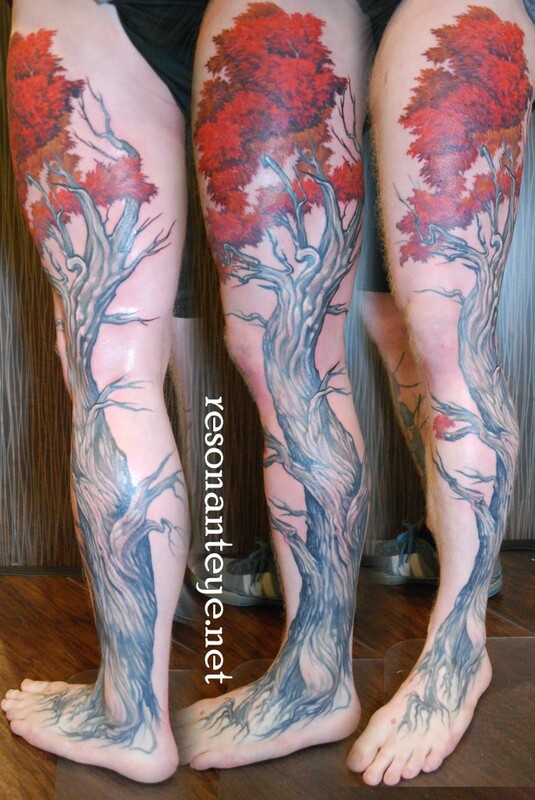 When I tattoo a tree, I try to imagine how a real tree would grow, if the muscles were wind and weather. 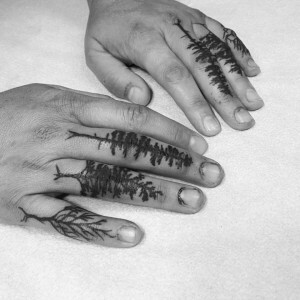 This means each tree is form-fitted to the wearer, their own. It would only fit that person, in that space of the body. I feel like trees adapt to any place where they grow, they adapt so completely, twisting to fit- they’re the perfect subject for tattoos. You need to start watermarking your photos! The first one has been brought to me several times for reference and I had no idea it was yours. yeah that was up on the tattoo page on wikipedia for a long while. So it tends to show up in google image search. I figure any artist worth their salt will use anything they are brought as a jumping-off point, anyway. I like the first tree. Is that a “testes tree” (pic no 10)? I am certainly hoping so! I want it done! 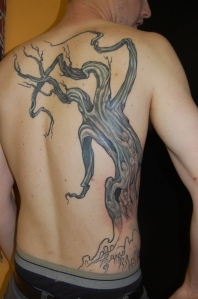 my all time favorite tree tattoo was one you did in 97-99 HST era on a woman back of her neck going into her hair. I remember that! 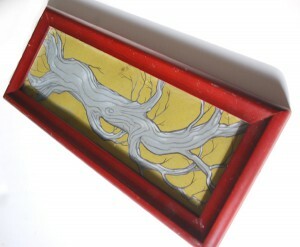 the roots on that one were so fun.